Vitamin A Quiz - Are you Bugs or Elmer? You have probably heard that eating carrots is good for your eyesight, but do you know what vitamin that’s found in Bugs Bunny’s favorite food helps keep your vision healthy? Here is a chance to test your knowledge of Vitamin A. Grab a pencil and paper and jot down your answers to these five True or False questions plus a bonus question. Then click on the Answers button to see how well you did and what your score means. TRUE or FALSE Question #1. In addition to being good for your eyes, Vitamin A is necessary for healthy skin and mucous membranes. TRUE or FALSE Question #2. Your body can convert beta-carotene, the orange pigment in carrots and other yellow and orange vegetables, to usable Vitamin A. TRUE or FALSE Question #3. Corn is a good source of Vitamin A. TRUE or FALSE Question #4. There is no upper limit established for Vitamin A since you can’t get too much of this vitamin. TRUE or FALSE Question#5. Liver is an excellent animal source of Vitamin A because it is a storage site for this vitamin. Vitamin A Quiz - TRUE or FALSE Bonus Question: “Retinol,” an ingredient used in skin creams is a form of Vitamin A.
Click here for ANSWERS to Quiz. Deficiency linked to poor economic conditions. In general, people who live in developed countries, where healthy eating is more doable, get enough Vitamin A. However, those suffering from eating disorders or living in poverty may not be eating enough food to get sufficient Vitamin A from their diet. In underdeveloped countries Vitamin A deficiency is a serious problem and a major cause of blindness and disease. Fat-soluble vitamins, because they cannot dissolve in water, must be absorbed through the lymph and then be transported in the blood by protein carriers. Any excess of the fat-soluble vitamins is stored in the fat storage areas of your body. Some vitamins are available from your food in the form of a “precursor.” This is an inactive form of the vitamin that can be converted by your body to the active form.An example of this is the beta-carotene found in carrots and other yellow, orange and dark green, leafy vegetables. If needed, your body can convert beta-carotene to Vitamin A.
Vitamins in foods can be destroyed by light, heat and oxygen. Storage methods and food preparation techniques will affect the amount of vitamins retained by the foods. 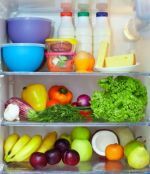 To minimize this problem, refrigerate produce in airtight containers, and during preparation, steam or cook vegetables lightly, avoiding high temperatures and extended cooking times whenever possible. Did you miss these Nutrition Quizzes? Click on the links below to go to quiz pages. Click here to go to from Vitamin A Quiz page to Vitamins page.